Happy 112th Feast of the First Night of the Prophet and his Bride! – Zero Equals Two! 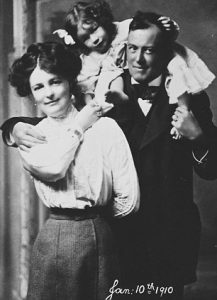 “Rose [Edith Kelly] and Aleister Crowley eloped on August 11 and married on August 12 1903, in order to save her from an arranged marriage. Their relationship, however, went beyond a marriage of convenience. The two went on an extended honeymoon that brought them to Cairo, Egypt in early 1904. “On 16 March 1904, ‘in an avowedly frivolous attempt to impress his wife’, Crowley tried to “shew the Sylphs” to her using the Bornless Ritual. Although she could see nothing, she did seem to enter into a light trance and repeatedly said, ‘They’re waiting for you’ After asking the god Thoth to clarify the matter and getting Rose to identify the source of the message as Horus, Crowley took Rose to the Boulaq Museum and asked her to point out Horus to him. She passed several common images of the god and led Aleister straight to a painted wooden funerary stele, the Stele of Revealing, from the Twenty-sixth dynasty of Egypt, depicting Horus receiving a sacrifice from the deceased, a priest named Ankh-af-na-khonsu. Crowley was impressed by the fact that the museum had numbered this piece 666, the number that he had identified with since childhood. “Rose had two children with Crowley: Nuit Ma Ahathoor Hecate Sappho Jezebel Lilith (born in July 1904, died in Spring 1906) and Lola Zaza (born in 1906). Rose and Aleister divorced in 1909.